When I started canning, one of the first things I put up were dill pickles. I love making pickles, and I’ve always loved eating them, but for some reason I was never really very interested in eating the ones I made. It took a few years and a little bit of reading up on pickling to realize that I was doing it all wrong. The half-sour and full-sour (or kosher dill) pickles I grew up eating in New York did not come from a jar full of vinegar. Though there are countless recipes for “kosher dill” vinegar pickles out there, the only way to make a real kosher dill pickle is by fermentation. Fortunately, fermented pickles are easy to make, easier than vinegar pickles, I think. The Joy of Pickling by Linda Ziedrich is a great resource, both for vinegar and fermented pickle recipes. For my first foray into fermented cucumber pickles, I followed her recipe for Lower East Side Full Sour Dills. This week I picked up a copy of The Art of Fermentation by Sandor Ellix Katz, and was emboldened to put up a batch of pickles without really following a recipe. That’s the beauty of fermented pickles. You can take any vegetables you want, in any combination, submerge them in brine, and in a few days or weeks you will have pickles. You’ll need a large glass or ceramic jar or crock large enough to hold all your cucumbers with at least a couple inches of space at the top. Something with a wide mouth is best. I used a two gallon glass apothecary type jar. Rinse off your cucumbers and trim off just the very tip of the blossom end. You just want to remove the little brown bit of residual blossom, because it contains an enzyme that can cause the cucumbers to soften. 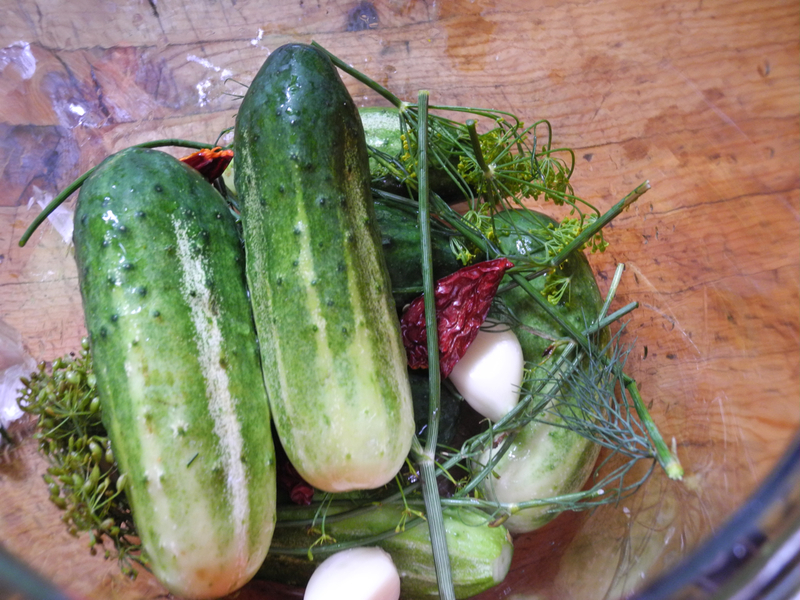 Layer the cucumbers in the jar with whole cloves of garlic, one or two small fresh or dried chiles, and some dill. I think its best to use umbels that have started to set seed but have not dried out yet, but you can also use the leaves. If you don’t have any fresh dill, dried dill seed is fine too. I added some whole mustard seed and coriander seed too. If you put your biggest cucumbers on top, it will help keep everything submerged. Then in a separate container mix up some brine, about 3 tablespoons fine grain salt per quart of water. Unrefined sea salt is best, but really any kind of salt will do. 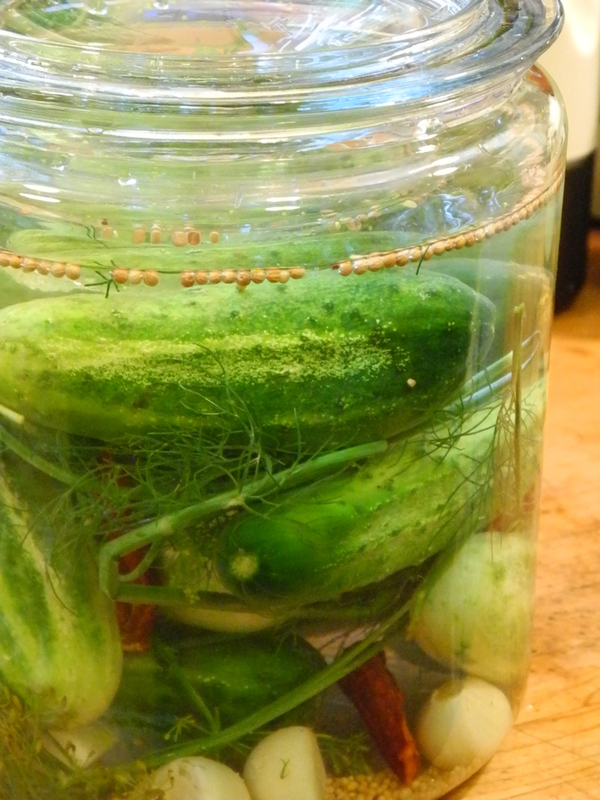 Once the salt is dissolved, add enough of the brine to the pickle jar to completely submerge the cucumbers. They will float to the top, so you will need to weigh them down. If you’re using a container with a very wide mouth, you may be able to fit a small plate or bowl inside the jar. If the weight of the dish is not enough to keep everything submerged, you can try setting small jar of water on top of the dish. I used a small, shallow glass bowl that was just a bit smaller than the opening of the jar. When the bowl was filled with brine, it was heavy enough to keep the cucumbers submerged. If you can’t find a dish that will fit inside your container, you can use a brine bag. Make up another batch of brine and pour it into a zip-top freezer bag. Set the bag inside the pickling container so that it covers the entire surface. You can cover the jar with loose fitting lid or a clean dish towel. Just don’t tightly screw down the lid if you’re using a jar, because pressure will build up inside the jar and it could explode. Put your pickles in an cool, out of the way spot. Check on them every couple of days, and if any scum forms on top of the brine, just skim it off. We’ll check back in on my pickles later. They should be ready in about two weeks, after which they will go in the refrigerator, where they’ll keep for months. Posted on August 18, 2012 by kate. This entry was posted in Preserving and tagged cucumbers, dill, fermentation, full sour pickles, garlic, kosher dill, pickles, recipes. Bookmark the permalink. I bought a pickling crock this year, just to do this…it’s still sitting empty. Maybe watching your progress will get me moving! Ooo, I am so inspired. I have never made pickles with cucumbers and actually own the Joy of Pickling. I think I see pickling cucumbers in next year’s summer garden. I’ve made refrigerator pickles using different methods, including a small batch today, but am very inspired after seeing this. I love the method and the results sound promising! I really need to get myself a big crock now, just like in your picture. I’ve been recently reading about the different kinds of pickles, and have heard of these, I’m intrigued by them, but don’t have a crock/jar for them…. hmmm…. Hmm…well you could make a very small batch in a liter jar if you have some small cucumbers. I think pickles are the new black! Reblogged this on Duncan's World. Tried this recipe in a ceramic crock. The pickles were fantastic after 7 days! Great flavor and not too salty. The only pickles I will eat going forward! Thanks for a great recipe! Can you can the finished fermented sour pickles to keep longer than the months in the refrigerator?